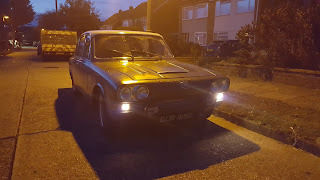 After a year or so of not doing much at all due to injury, it was time to take to the roads for my first proper road trip since last September. A small group of us had decided to take to the Highlands and run a tour of Northern Scotland. 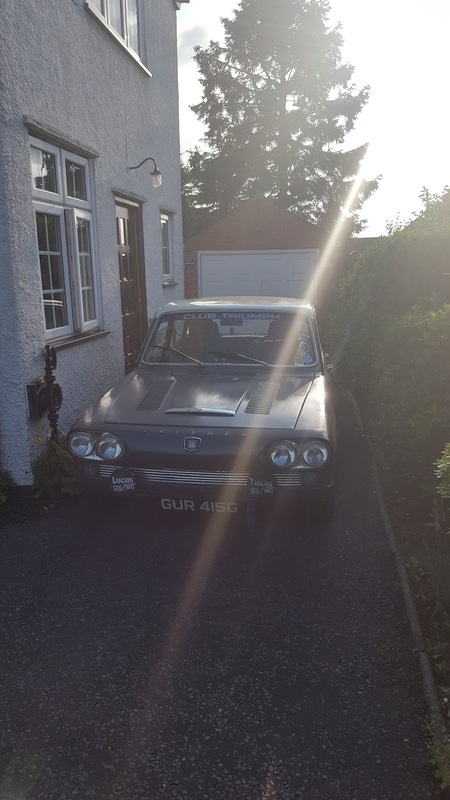 So,with the Hotels booked, Friday morning finally came around and after putting in a few hours at work, it was time to head to Derby to collect my co-driver Dave Harvey. A reasonably clear run saw me arrive at Dave's at 2pm and after a quick chat we set off across the A50 and onto the M6 to start heading North. We stopped for coffee and petrol at Lancaster services and in general were doing well for time, although an accident in the roadworks lost us about 20 minutes. By early evening we were on the A9 and heading in the direction of Inverness. 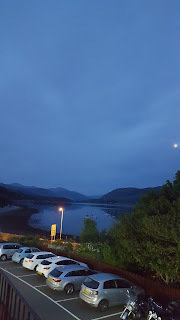 The original plan was to all meet at the Premier Inn, Inverness, but with me having to work Friday morning, we were never going to make check-in before it closed. Therefore. our planned stopped was the quaint little town of Dunkeld, about 100 miles short of Inverness and we would catch up with the others sometime Saturday. We arrived at Dunkeld at 9.20pm and the friendliness of the hotel staff was in complete contrast to the town folk! We tried for a Pizza only to be told that they stopped serving at 9.30pm and then walked into town until we found an Indian Restaurant only to be told they stopped serving at 10pm! (although the takeaway part was open until 11pm!) We then gave up on food and settled for a couple of pints of Tennants and a bag of crisps each before retiring for the night. Our quaint little Friday night stop. Breakfast in the guesthouse wasn't served until 8.30, so we told the guys at Inverness to crack on without us and we would catch them up on route. The Plan had been to all meet at their hotel at Inverness and then head to the Applecross pass to tackle the mountains. Dave and I cracked on with only a brief stop for coffee and fuel and then managed to meet up with the rest of the crew who had stopped for a leisurely lunch break at Applecross. 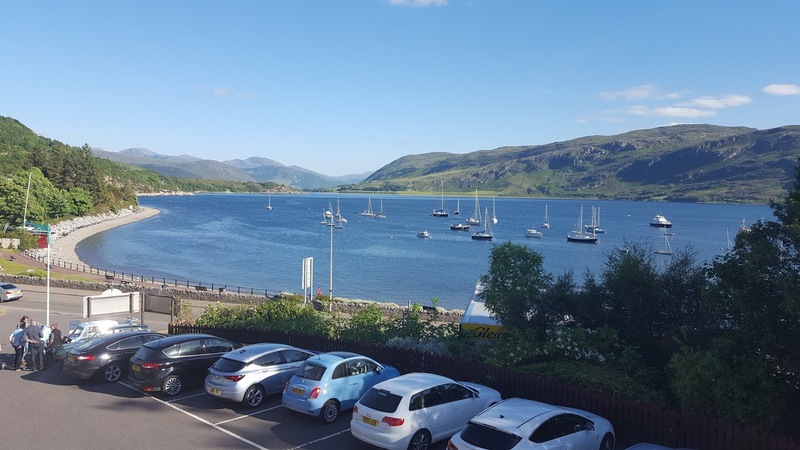 After leaving Applecross and its stunning scenery, we travelled along the coast road and encountered even more stunning views just about everywhere. It seemed like every time we came round a bend, we were met by sights that just absolutely took your breath away. it was incredible. After more leisurely driving we headed for our hotel stop at Ullapool. It was a beautiful place and our hotel room even had a balcony to step out onto overlooking the bay. It was a grey start, but the sun soon made an appearance and before long the day was as glorious as it had been the day before. A 'brew with a view' as it had become known was the order of the day and the camping stove was dragged out and tea, cake and Hobnobs were consumed at the beautiful location of Sandwood Bay. 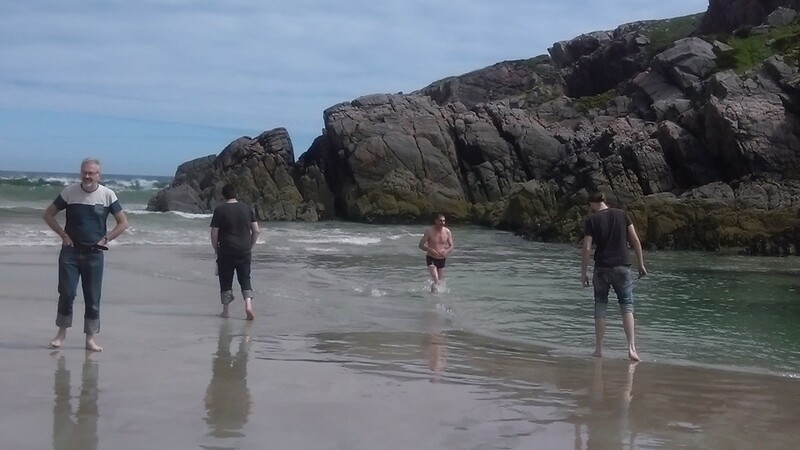 It was a bit too much for some us who had to discard our shoes and socks and go for a paddle in the beautiful cold sea. Dave Langrick decided to go one further and dive completely in much to the amusement of the rest of us. With our frolicking in the sea complete we continued around the coast road and across to the Kyle of Tongue. Again, there is nothing but beautiful scenery up here and it makes you wonder why nobody comes here, the roads are almost empty. At Tongue we turned right onto the A836. After a few miles at Altnaharra, this road links up onto the RBRR route so we were on familiar territory. 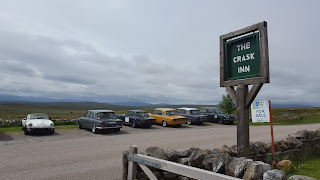 We headed down toward Lairg and stopped at the Crask Inn for lunch. We always drive past the Inn on the Saturday morning on the RBRR but it's never been open, so we took advantage and enjoyed some sandwich's and coffee and good hospitality. The last leg of the trip saw the skies get darker and the rain the that had apparently plagued the rest of Scotland all weekend had finally caught up with us. By the time we got to our next stop at Inverness it was well under way. A walk to the Indian restaurant later that night saw us all well soaked. However, the food was good and we finished off with a quiet drink in the hotel bar. We all met again for breakfast the following morning and then departed to make our long Journeys home. My sat-nav was telling me I had 573 miles to cover and that was without the diversion to Derby to drop Dave off! Around the Lancashire area the motorway signs were telling us that there were 30 minute delays on the M6 at junction 19, so we took the M61 to Bolton and then onto the M60 Manchester ring road. We then took the Woodhead pass over to Sheffield. (This was a route I used to take in my truck driving days when the M6 was closed) From there it was just a short blast down to the HarveyTune HQ at Derby where we arrived at 7.15pm. After emptying Dave's gear out of the car and filling the boot up with parts that I had bought off him, we had a quick cup of coffee and then I made tracks. It was now nearly 8pm and I still had 160 miles to cover and had to be at work at 7am the next morning! Luckily, the M1 and M25 were clear and I arrived at my place at 10.15pm. It had been a brilliant trip with some excellent company and a great co-driver. Gertie home at last after another mammoth journey.